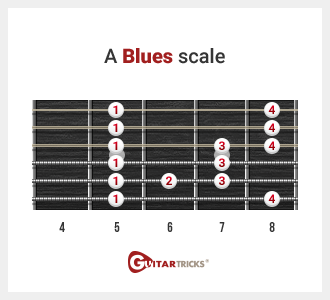 Scales are the gateway to playing licks, riffs, and solos on guitar. So what is a scale? Here's a simple definition: a succession of notes played in a certain key determined by its root note. 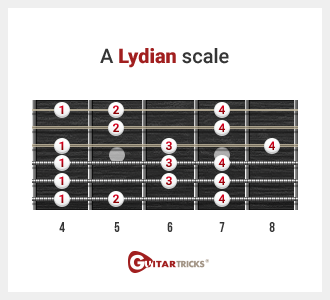 The foundations of the most famous guitar solos of all time lay in the use of guitar scales. Learning a few or learning the entire list below will certainly improve your technique with guitar and turn you into a shredding superstar. For the nature of this article, we will illustrate all the scales in the key of A. Let’s get started! 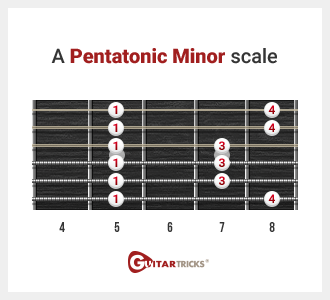 The Minor Pentatonic Scale – the grand master of all scales – learning this scale will help lay the foundations for your career as soloist. 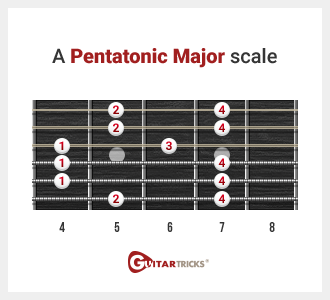 The Major Pentatonic Scale – the other grand master of all scales, but it’s a major scale as opposed to minor. 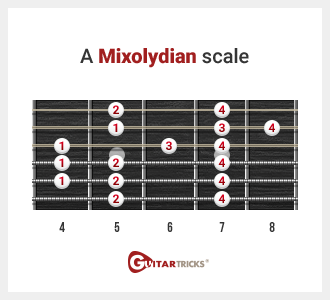 The Mixolydian Scale - a major scale with a flatted 7th note! Wildly used in a variety of popular music from The Beatles to Iron Maiden. 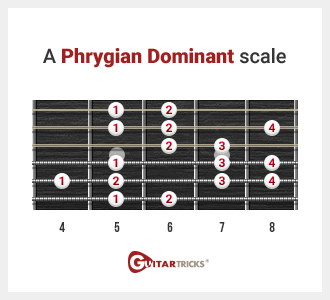 Phrygian Dominant – a bonus scale I discovered on the internet a few years back, this one speaks for itself if you are hoping to tap a Spanish style vibe. 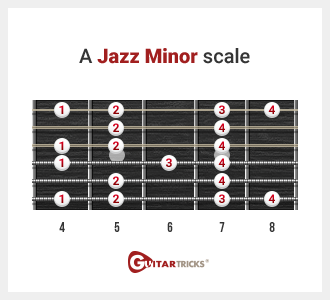 Jazz Minor – a major scale with a lowered 3rd degree for great jazz improv. It rises and resolves for all your weird 7th chord users out there. 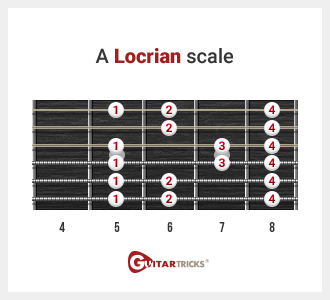 Locrian – this scale sharpens the second and third notes of the diatonic Locrian mode. This scale doesn’t resolve as well as others mentioned here and is not used much in Western music. Still, it’s good to know for expanding your scale vocabulary. 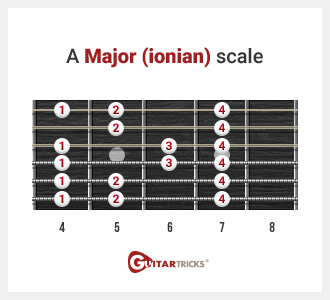 Major (Ionian) – with its dissonant major sound, the major Ionian is a great way to take your soloing to the next level. 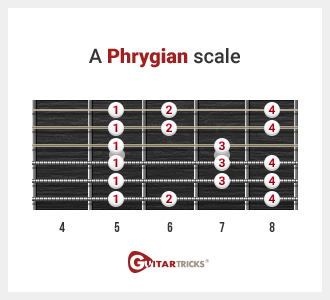 Phrygian – this is a minor mode that appears with a bII. It is very hard to capture this scale in modern music as a song can start off with a Phrygian vibe but change into another mode completely! 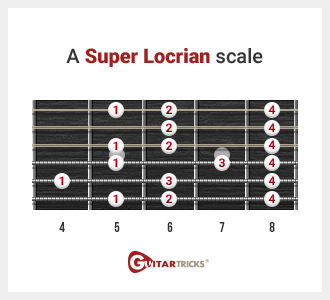 Super Locrian – this altered scale is perfect for jazz-rock fusion & jazz improv. Try playing it over altered dominant 7 chords. 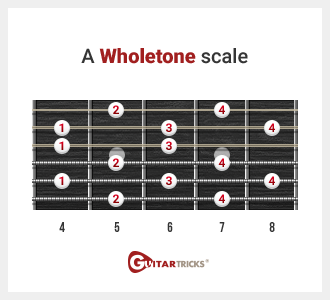 Whole Tone – no semitones to be found here. 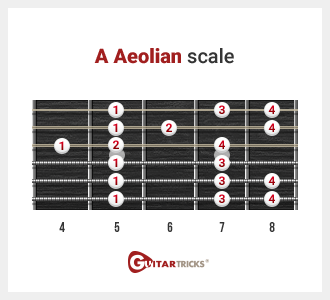 Only whole tones separate this scale from scales like chromatic ones, which consist entirely of half steps (or semi-tones). Blues Scale – need a different scale for your blues solo? Look no further! 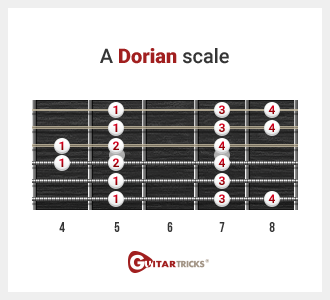 Dorian – very popular in jazz, the Dorian mode is also at home in rock and metal for added complexity. Daft Punk’s “Get Lucky” also utilizes this unique mode! Aeolian – this musical mode is the natural minor scale. Famous songs include Fleetwood Mac’s “Rhiannon” and “Sweet Dreams” by the Eurythmics. 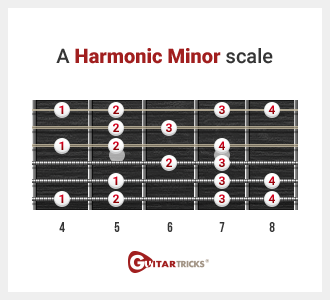 Harmonic Minor – another natural minor scale but the 7th note is raised one semitone both ascending and descending. The talented guys in Muse use this mode a lot but it’s important to know that many songs using this scale don’t often resolve in the same scale. Need more scales? Check out our handy Scale Finder for even more scale positioning!